Brazil is likely to reach the Millennium Development Goal of universal primary education by 2015. According to the UNESCO Institute for Statistics (UIS), 94 percent of all children of primary school age (7 to 10 years) were enrolled in primary school in 2005. Data from the 2006 National Household Sample Survey (Pesquisa Nacional por Amostra de Domicílios, PNAD), analyzed in an article on school attendance in Brazil, show that 99 percent of all children between 7 and 10 years were in pre-primary, primary or secondary education. PNAD data can also be used to demonstrate how the education system in Brazil has expanded over the past decades. The PNAD survey collected information on the highest level of education attended for all persons in the sample. By comparing the highest level of education of persons born in different years it is possible to show the change in school attendance patterns over time. 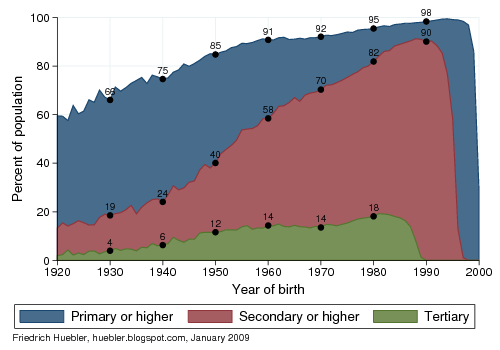 The following graph displays the highest level of education for persons born between 1920 and 2000. Household members born in 2000 were 5 or 6 years old at the time of the survey in 2006. Data source: Brazil National Household Sample Survey (PNAD), 2006. Only 59 percent of all Brazilians born in 1920 ever attended school, and three out of four persons who attended school never went beyond primary education. Primary, secondary and tertiary school attendance rates increased steadily over the following decades. By the 1960s, nine out of ten Brazilians were able to receive a formal education. 91 percent of all persons born in 1960 attended at least primary school, 58 percent in this age group attended at least secondary school, and 14 percent went to a university. The expansion of the primary education system began to slow down in the 1960s, after it had already reached a high level of coverage, but secondary school attendance rates continued to grow at a rapid pace. Among persons born in 1990, 98 percent attended primary school and 90 percent attended secondary school. Among persons born in 1994, 99 percent attended primary school. The peak value for participation in secondary education is 91 percent for persons born in 1988. Fewer Brazilians have tertiary education, but almost one fifth of the population born around 1980 had attended a university or other institution of higher education by the time the PNAD survey was conducted in 2006. The peak value for participation in tertiary education is 19 percent for persons born in 1981.